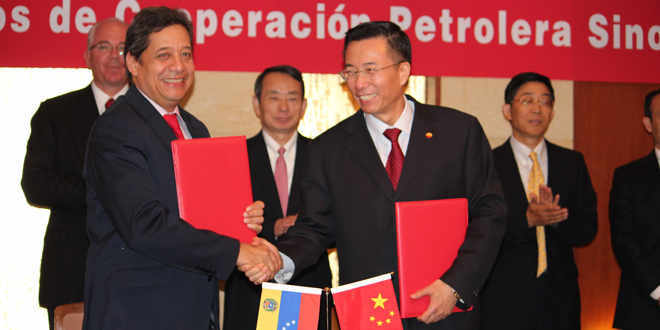 You know the story that ran a few days ago about the Maduro government signing agreements with Chevron and the CNPC to develop some oil fields? Well, according to Caracas Capital Markets, the fine print says that PDVSA is getting the funding from both companies, but it won’t manage the funds. Instead, both the Chevron funds and the CNPC deal will be managed by Chevron and the Chinese, respectively. It’s you and me who have to pay the bill though. Think of the incentives. Chevron gets to spend billions of dollars, with barely any oversight, and as long as they increase oil production everything is dandy … and your grandson foots the bill! Now, I sort-of understand where both companies are coming from. If I were to lend a thousand bucks to my drug-addict brother-in-law (hypothetical here, all my brothers-in-law are great), I would also take over his finances to make sure he spends the money on food and medicine. But still, this reaks. PDVSA can’t even be trusted to spend its own money soundly because it has become a cash cow, not an oil company. We lost the world’s trust, so now that we’re bankrupt we must give up remaining control.